Nutrition: This week we talked about lipids, specifically fats and oils. Simply put, fat is a lipid that is solid at room temperature while oil is a lipid that is usually liquid at room temperature. When cooking with milk, remember a very important rule: Use moderate heat and heat the milk slowly (but not too long) to avoid curdling - a grainy appearance with a lumpy texture. From a scientific point of view, milk curdles when the casein (protein in milk) becomes solid and separates out of the milk. Add other food products to hot milk products slowly, stirring with either a spoon or a wire whisk, if preparing a sauce, to avoid lumps. Be especially careful when adding foods high in acid - milk has a tendency to curdle if not beaten quickly. Use low heat with cheese. It is best to use as low a heat as possible when cooking with cheese. Cheese has a tendency to toughen when subjected to high heat and long cooking due to its moisture evaporating, fat melting, and protein becoming stiff. Avoid boiling at all costs. Use short cooking times. 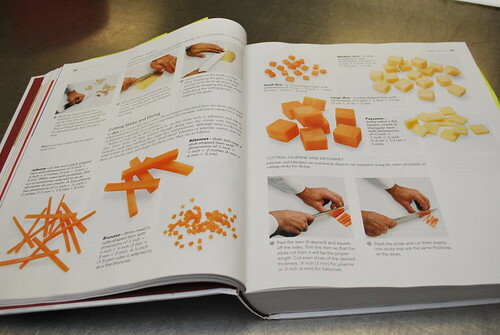 Most recipes require the addition of cheese at the end of the recipe to avoid overcooking. Grate the cheese. The best way to add cheese to a recipe is to grate it. Grating will break the cheese into small, thin pieces that will melt and blend quickly and evenly into the end product. Grating also creates an image of more cheese when it is melted on top of a product (au gratin). Low fat cheese are available and have come a long way in flavor and texture. If moderation is your goal and not total elimination, be sure to add an extremely aged and flavorful cheese into your preparation at the end, when your guests will taste it on their first bite. To make "whipped cream," drain plain nonfat yogurt in cheesecloth to remove as much liquid as possible. Fold whipped egg whites into the yogurt and add a little honey for flavor. Use frozen pasteurized egg whites to avoid any food safety (salmonella) problems. The other options is to use a dollop of real whipped cream without adding sugar. To make an excellent omelet without cholesterol, whip egg whites until they foam. Add a touch of white wine, freshly ground mustard, and chives. Spray a nonstick pan with oil and add the eggs. Cook like a traditional omelet. When the omelet is close to done, put the pan under the broiler to finish. The omelet will puff up. Stuff the omelet, if desired, with vegetables, a shaving of flavorful cheese, or even some fresh fruit filling, and then fold over and serve. For another interesting appetizer or a dinner or breakfast entree, make a mixture of egg whites, herbs, and cracked black pepper and pour it over a vegetable oil sprayed creme brulee dish filled with mushrooms or other cooked vegetables and a little cheese for a very nice omelet alternative. For color and flavor, serve an omelet with spice salsa poured on a portion of it, or serve it with salsa, black bean relish, and blue corn tortilla chips to create more breakfast options. Homework: After the first major exam, I did great! I do have another quiz coming up for the next class on carbohydrates and lipids, along with a worksheet due. Culinary Principles 1 - This week we had some fun in our lecture with individual presentations. Everyone was asked to write a 3 page report on a spice or flavoring of our choice. Along with the paper, each of us did a presentation on our spice or flavoring in front of the class. My classmates are a great bunch and had some really good presentations including ones highlighting ginger (with a sample of ginger ice cream and soft ginger cookies), cilantro (with a sample of cilantro pesto filled croissants and cilantro dip & chips), and habanero peppers. I did my report and presentation on salt because it's the one flavoring that we cannot live without. For my presentation, I covered the three types of salt (table, kosher and sea salts) and also did a salt tasting. My salt tasting simply involved slices of bread spread with unsalted Plugra (European) butter and I provided a sampling of Hawaiian red sea salt, Hawaiian black sea salt, Himalayan Pink sea salt and Mediterranean sea salt. To end my presentation on a sweet note, I also made some salted caramel brownies for everyone. After a few class presentations, we had a lecture on flavors and flavorings. 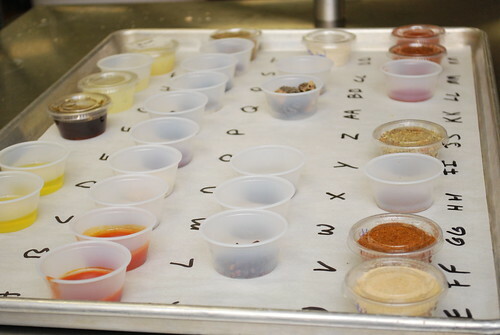 This week our focus on was flavors and flavorings. Things in this class are getting to be more interesting as we finish up covering the basics. Essentially, its the chef's role to consistently present well flavored foods to excite the consumer's brain and palate. This can be accomplished by an act as simple as sprinkling a bit of salt over a ripe watermelon to enhance the melon's natural sweetness or as complicated as using a long simmered stock made from wild mushrooms to entice a sauce flavored with herbs and wine. 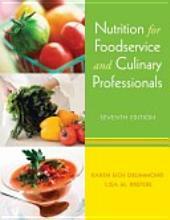 In either case, the chef must understand how to flavor foods and be able to recognize flavoring ingredients and know how to use them. We discussed the sense of taste and smell and the flavoring ingredients used in the professional kitchen to enhance foods. 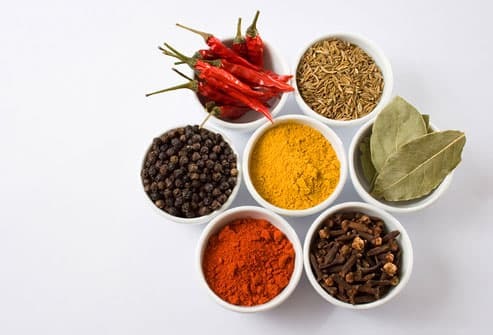 Flavorings - the herbs, spice, salt, oils, vinegars, condiments, wines and other alcoholic beverages typically used to create, enhance or alter the natural flavors of a dish - were the main focus. We all know the four different tastes we have - sweet, sour, salty, and bitter. However, taken from the Japanese, we now are starting to recognize a fifth sense of taste known as umami. Umami is from the Japanese word umai, which means "delicious." It's hard to translate umami in English but some people refer to it as a food's savory characteristic, the richness or fullness of a dish's overall taste or even the meatiness or meat taste of a dish. A couple things affect our perception of flavors - temperature, consistency, presence of contrasting tastes, presences of fats and even color. Since all of us are different, even our age, health and smoking can affect our perception of taste. There are even what we call "super tasters, medium tasters and nontasters." 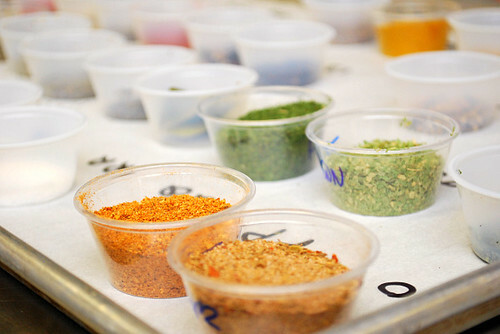 Top notes or high notes - the sharp, first flavors or aromas that come from citrus, herbs, spices and many condiments. These top notes provide instant impact and dissipate quickly. Middle notes - the second wave of flavors and aromas. More subtle and more lingering than top notes, middle notes come from dairy products, poultry, some vegetables, fish and some meats. Low notes or bass notes - the most dominant, lingering flavors. These flavors consist of the basic tastes (especially sweetness, sourness, saltiness and umami) and come from foods such as anchovies, beans, chocolate, dried mushrooms, fish sauce, tomatoes, most meats (especially beef and game) and garlic. Or they can be created by smoking or caramelizing the food's sugars during grilling, broiling and other dry-heat cooking processes. Aftertaste or finish - the final flavor that remains in the mouth after swallowing; for example, the lingering bitterness of coffee or chocolate or the pungency of black pepper or strong mustard. Roundness - the unity of the dish's various flavors achieved through the judicious use of butter, cream coconut milk, reduced stocks, salt, sugar, etc. These ingredients cause the other flavorings to linger without necessarily adding their own dominant taste or flavor. Depth of flavor - whether the dish has a broad range of flavor notes. 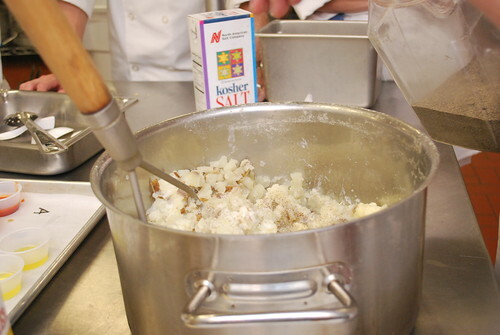 All the potatoes we diced up were boiled and made into a massive pot of mashed potatoes. Here's Chef S working his magic with the largest potato masher I've ever seen! Once we had our mashed potatoes (which were delicious, by the way) we were ready to work our taste buds. 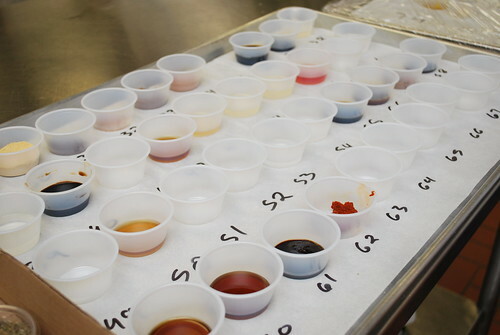 Chef S prepared over 100 samples of various flavorings which included spices, dried herbs, vinegars, oils, and condiments. Each sample cup was passed around where everyone took a small taste with our taster spoons. We took down notes identifying the samples, talked about various uses and shared our thoughts describing what we tasted. The mashed potatoes served as a great medium to try the items and sparked a few recipe ideas to flavor mashed potatoes in the future! 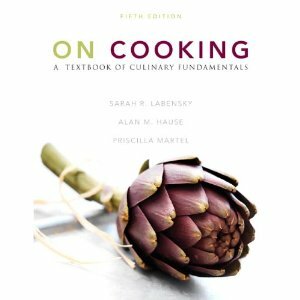 Homework: At our next class, we'll be starting off with a quiz on chapter 5 (tools & equipment) and chapter 8 (mise en place). Another set of chapter questions are due. We'll also have other classmates do presentations on their chosen spice or flavoring. At this point, I'm really loving classes and I've been doing well with the weekly quizzes. I've never been so eager to attend school until now and it certainly helps if you really have a deep passion and love for the culinary arts. So that's it for this week's recap. I've been meaning to post on knives and knife skills but my plate has been really full lately with catering jobs, classroom homework, managing and hosting events for What's Cookin, Chicago and being a wife and mom to my 4 month old. I promise to get to it soon when some things die down (do they ever?!). I definitely want to share some things I learned on knife skills since I know we could always improve our skills. Stay tuned for what I learned in the coming week with my week 5 recap. Until then, happy cooking and baking! 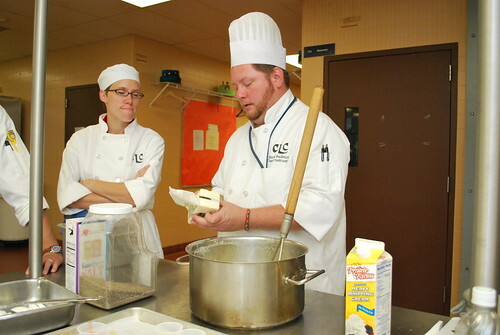 Culinary school is amazing. I went to one about 10 years ago and now i have my own catering business and am opening a restaurant in the fall. Good luck and enjoy it. I am super excited to read your blog. 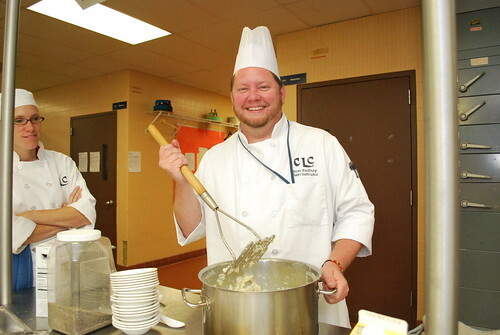 I am just applying for culinary school now and am super nervous. I havent been to school since I graduated high school like 6 years ago! Im excited to read what you are learning and how you are doing. Thanks so much for your blog, I hope I can ask you questions in the future, as I will begin Culinary School, on January 3rd!